for your Festive Thanksgiving Table! Reproduced from an original American design, this brightly-hued, sturdy cardstock turkey is printed on both sides in bright, autumnal colors. 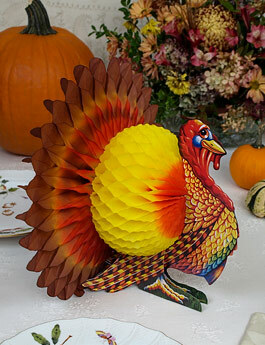 Made with a fold-open, honeycomb art tissue body, the centerpiece turkey is 12" high with a flamboyant fan of multi-color honeycomb "tail feathers" that are 13" across.